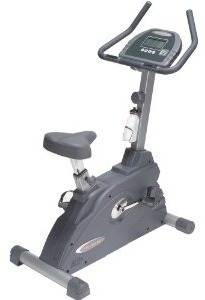 The Body Solid Endurance B2U upright exercise bike has an extremely quiet ride and a lifetime warranty on parts. If they would just re-design the console, it would be a decent buy. The single window console readings give feedback for time, speed, distance, pulse, and calories. Warranty: lifetime in-home warranty covers everything. Forever. 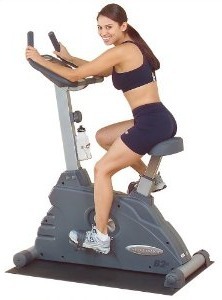 The Endurance B2U upright exercise bike has a heavy 24-lb flywheel, a Poly-V belt drive, and 15 levels of resistance. It also features Dura-Firm seat padding, handgrips for heart rate monitoring, front transport wheels, and a water bottle holder. There’s no plug-in required on this bike as the display operates on two AA batteries. The console turns off automatically after a few minutes of inactivity. Other than that, we also agree with some users who say they were under whelmed by the cheap-looking, simplistic, one-window console. It scans readouts, but for this kind of money, you would think they would design something a lot more appealing and informative. The lifetime warranty on the Endurance B2U upright exercise bike is great, but otherwise there is nothing all that exciting about the B2U. Since a 24-lb flywheel is overkill on an upright, you can get a comparable bike from another brand for about the same money ($599) or less. If you feel a Schwinn or Nautilus bike at around $399 doesn’t have the quality and features you want, we suggest you step up in price to a Lifespan C3 which is a Best Buy for a traditional upright in the $600 to $900 range.